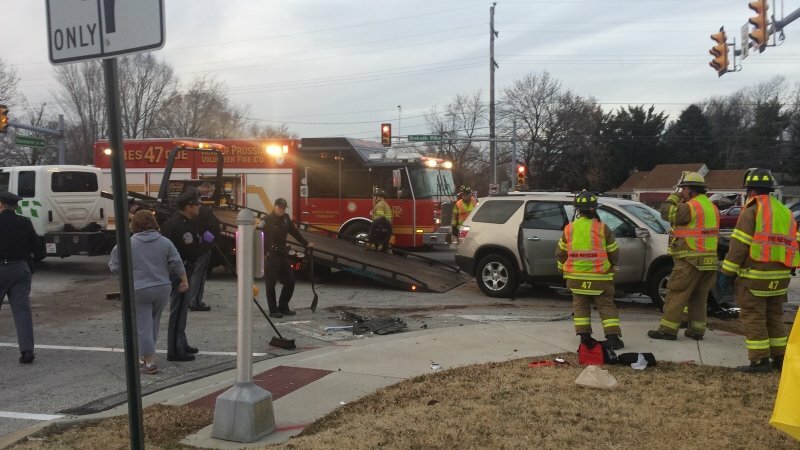 Saturday, November 30, 2013 At approximately 4pm Saturday the county 9-1-1 center alerted the King of Prussia Volunteer Fire Company (station 47) to respond for a vehicle accident with victims trapped on route 202 at Brandywine Circle. Rescue 47 arrived prior to EMS units to find a multi vehicle accident with numerous injured victims. Once the officer of Rescue 47 sized-up the scene and conferred with the EMS Chief it was determined that no extrication services would be needed. However, several KPVFC members were pressed into patient care mode due to the limited EMS staff that was initially on scene. Deputy Chief Keszczyk, Firefighter Ralph, and Firefighter Davis were directly involved with patient care while other crewmembers assisted with patient packaging and placing them into ambulance. Squad 47’s crew was placed into service performing various tasks including hazard control and vehicle stabilization. Engine 47-2 was directed to the township property at Ross Road & Henderson Road to secure the site for possible aviation medical services, which ended up not being utilized. The crewmembers also used the hydraulic “spreaders” to open the hood of one vehicle to gain access to the battery so it could be disconnected. KPVFC Assistant Chief Thomas was requested to drive a Lafayette EMS transport unit to Paoli Hospital so other staff members could be available for patient care and transport. In total, seven people sustained injuries and four of those victims were transported to area hospitals. All KPVFC units cleared the scene in time for dinner.